The Curse of the Black Spot was clearly a step down from the series-opening two-parter, and in my estimation, it’s also the weakest episode of Steven Moffat’s tenure as head writer thus far. It’s certainly not bad – Moffat still hasn’t presided over a legitimately poor Doctor Who installment – but it was mediocre, and that’s something we haven’t been accustomed to since Moffat took over for series 5 last year. I suspect that many who find fault with this episode will point towards its disconnect with the events of the premiere hours, as Black Spot neglected to give viewers any new information about the numerous mysteries still hanging over the series. That didn’t bother me – I certainly love that Moffat forged a brilliant season-long story arc last year, and has begun an equally intriguing arc this season, but nevertheless, Doctor Who isn’t a fully serialized show, and it never should be. The show can’t function without at least a few standalone adventures – if the Doctor doesn’t take the occasional detour to a pirate ship or similarly interesting locale, then it’s not really Doctor Who. Last year, Moffat found the right balance by making sure that every episode, whether it was heavy in “arc-material” or not, made at least a few references to the main storyline, and Black Spot continued this trend. It may not have given us any more information about the Doctor’s death or Amy’s bizarro-pregnancy, but it did demonstrate that the characters are still cognizant of these mysteries, and that’s all I ask for. If anything, it’s good that the show took a week to decompress after the craziness of the two premiere episodes, because another madcap hour of intense plot-driven action may have been overkill. In terms of fitting in with the tone and story of the season, Black Spot played its cards right, and I have no complaints there. It’s the episode itself that was weak. The writing was generally uninspired, failing to take advantage of the copious opportunities that come with putting the Doctor on a pirate ship. The pirates themselves were fairly uninteresting caricatures, lacking any of the personality or bite I associate with pirates. I do understand the pirates can’t be too intense, since Doctor Who is a family show, but nevertheless, they were a most uninteresting and underdeveloped bunch, and putting a poorly-written little kid on the ship didn’t help matters. I did like Captain Henry Avery, played by Hugh Bonneville, and his scenes with the Doctor were generally quite strong. Yet the Captain also fell into one of my personal TV pet-peeves, where a guest-star is given emotional moments that fail to ring true since we’ve only known the character for a brief amount of time. Even the inherently intriguing mystery that drove the episode felt rather bland. 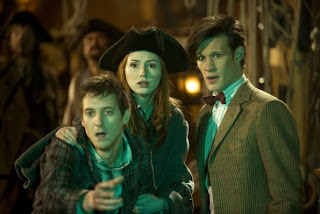 The siren’s first scene was suitably creepy, but from there on out, the sense of danger never really felt palpable; the bland and uninteresting pirates were clearly cannon-fodder in the first place, and since we can safely assume that the Doctor, Amy, and Rory aren’t going to be kicking the bucket this early in the season, any initial sense of tension was soon lost. The episode absolutely kicked things into high-gear in the third act, however, nearly redeeming many of the hour’s faults. We got a series of very satisfying and utterly fascinating revelations, starting with the reveal of the other-dimensional space ship and culminating in the Doctor discerning that the Siren was actually an automated (medical) Doctor. In addition to being completely unexpected, these twists really elevated the entire episode, and gave all the characters chances for showcase scenes. Amy and Rory shared a great sequence near the end, as Rory instructed his wife on how to save his life, and even though I didn’t like the little kid, the Captain’s decision to stay on the spaceship with Toby and the rest of the crew was both touching and invigorating (pirates in space? Hell yes!). The resolution of the central mystery was the absolute high-point of the hour, but at the same time, it’s also one of the episode’s weaknesses. Stories based around twist endings simply can’t hold up to repeat viewings, and I suspect that it will be hard to enjoy Black Spot on subsequent run-throughs, knowing all the secrets. I haven’t talked much about Murray Gold’s score yet this series, but as expected, he’s been delivering in big ways, and his creative score for Black Spot made the entire affair much more enjoyable. The music had an appropriate swashbuckling flavor that recalled the scores to the Pirates of the Caribbean films, but at the same time, there were some absolutely heart-wrenching emotional pieces scattered throughout, particularly at the end, that salvaged plenty of otherwise lifeless sequences. I hope that when the series six soundtrack is released, it contains a healthy amount of selections from tonight’s episode. There’s not a whole lot more to say about Black Spot – it was disappointing, but not bad, and next week will surely be memorable, as it’s the first episode written by iconic sci-fi writer and fanatical Doctor Who fan Neil Gaiman. We’ve been hearing about a Gaiman-penned episode for years now, and I couldn’t be more excited for the episode’s prospects. In the forty-eight years since Doctor Who first began, the show has undergone many transformations, with different writers leaving their distinctive stamps on the series and establishing variant tones and storytelling sensibilities across the decades. The Doctor has travelled to hundreds of locations across space and time with a multitude of companions, and even the Doctor himself has had eleven different faces. Through it all, there’s only really ever been one true constant – the TARDIS. The TARDIS is what makes the Doctor’s adventures possible, of course, but more importantly, it’s the one companion that the Doctor will never be without. No matter where the story takes place, who the Doctor travels with, or even who plays the Doctor, the TARDIS will always be there. It’s the heart and soul of Doctor Who, and as was made clear tonight, it’s captivated the heart and soul of the Doctor himself for 700 years. It’s this fundamental understanding of the Doctor’s relationship with the TARDIS that makes Neil Gaiman’s script so effective. Gaiman, a lifelong Who fan, has written an episode that functions on every level as a passionate love letter to the series. I think most fans can agree that the fundamental appeal of Doctor Who lies in escapism – is there any science-fiction concept as wondrously appealing as hopping in the TARDIS and literally going anywhere? The TARDIS is what makes Doctor Who the unique and wonderful creation that it is, but that’s an easy fact to take for granted. After hundreds upon hundreds of episodes, it’s natural to just accept that the TARDIS is there, a device to get the Doctor from place to place. The true genius of Gaiman’s script is that he doesn’t take the TARDIS for granted, and devotes the entire hour to celebrating the often unspoken aspects of the TARDIS that make it so fantastic – indeed, he does so by literally giving it a voice. In so doing, Gaiman makes the audience see the incomparable beauty of the TARDIS anew, reminding each and every fan why we started loving this show in the first place. One of the key themes of the episode is that the TARDIS is bigger on the inside in more ways than just one – it’s deeper, older, wiser, and more emotional than even the Doctor had ever imagined, and seeing the true depth of the TARDIS’s soul makes him love his big blue box even more than before. This is why the Doctor is asexual, a being who doesn’t fall in love with his companions – as the episode’s title implies, he’s already “married,” and there’s no being he could possibly love more than the TARDIS. Tonight’s story was, in essence, a reconfirmation of vows, a rekindling of the unconditional love the Doctor and his TARDIS have for one another. It’s a beautiful story, and as wonderful as Gaiman’s script is, I have to credit Matt Smith with truly bringing these emotions to life. In my mind, the hour’s pivotal scenes come near the end, first when the Doctor explains to House how the soul of the TARDIS is going to prove too much for House to handle, and later when the Doctor stands alone at the TARDIS console, asking if the TARDIS can hear him with a poignant sense of childlike wonder. In both cases, the TARDIS no longer has a voice – Smith is acting for both the Doctor and the TARDIS, and he completely sells the relationship. The soul of the TARDIS is always there, even when not physically embodied as it was for much of the hour, and the Doctor has the unique ability to be in commune with this spirit. The brilliance of Smith’s performance is how effortlessly he illustrated this to the audience. He’s played the Doctor as old and young, wise and arrogant, compassionate and vengeful, but he’s never played the Doctor quite like this. It’s fascinating, touching, and proves that even when we think he’s shown us everything, Smith still has more surprises in store for us. He’s my absolute favorite Doctor, and episodes like this demonstrate why. Of course, the whole cast was excellent, and though this hour was really a showcase for the Doctor, Amy and Rory both got some of their most impressive material of the season thus far; Karen Gillan and Arthur Darvill absolutely rose to the occasion. Suranne Jones effectively illustrated the many varied emotions the TARDIS felt stuck in a human body, while the uncharacteristically deep voice of Michael Sheen was perfect for the ominous House. We even got to see an Ood again, and though “Nephew” didn’t do too much during the episode, it was nice to see one of my favorite Who aliens make a reappearance. It would be criminal to finish this review without referencing the episode’s absolutely awe-inspiring visuals. The revived series has often looked cinematic, especially during Steven Moffat’s current tenure, but never to this degree. Not only did we get all sorts of new locations, but they were all brought to life with stunning clarity and imagination. The trash planet “outside of the Universe” looked real and lived-in, while the interior corridors of the TARDIS – which we hadn’t seen on the revived series until tonight – fit in perfectly with both the classic and modern aesthetics of the show. Throughout, Richard Clark’s direction was exceptional, capturing all of these new locations and stunning visuals with a very cinematic flare. I can’t imagine how much money was poured into this episode, what with the multitude of flawless special effects shots, but every cent was worth it, because the imagination of Gaiman’s script demanded the extra dollars. This is an instance of effects working in total service to the story, and The Doctor’s Wife wouldn’t have worked if the Who-crew hadn’t gone the extra mile. In fact, the entirety of The Doctor’s Wife went the extra mile – from the acting to the effects to the direction to Murray Gold’s as-always impeccable score, everyone involved gave it their all to bring Gaiman’s incredible story to life. If the episode had any one flaw, it’s that the sheer number of ideas present may have been too much for one standard 45-minute episode; a full hour-long version of this story, with more room to breathe, may have served the episode better. Still, it’s extremely hard to complain about an episode so clearly tailored to the heart of every Who fan, one that reminds me why I fell in love with this show in the first place. --One of the greatest joys I had watching the episode was seeing the three TARDIS console designs together. We had the current one, of course, as well as an appearance by the Eccleston/Tennant TARDIS, which made me feel very nostalgic. Meanwhile, the TARDIS the Doctor built in the scrapyard resembled the original TARDIS console of the classic series. In essence, we got to see all three main TARDIS designs, a very fitting treat given the nature of the story. --I almost opened the review with this line from the TARDIS spirit: “…I always brought you where you needed to go.” That was the moment I fell in love with this episode – such a great description of how the TARDIS interacts with the Doctor. --I sincerely hope Moffat brings Gaiman back to write another episode next season – Gaiman is too good a talent not to utilize again. 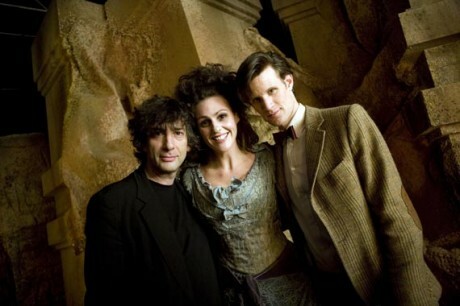 I’d especially love to see Moffat and Gaiman team up on a script, though it may be genius-overload.